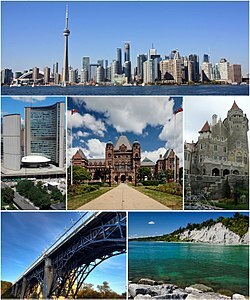 Toronto is the largest city in Canada and the provincial capital of Ontario. It is located in Southern Ontario on the north-western shore of Lake Ontario. A relatively modern city, Toronto's history dates back to the late 18th century, when its land was first purchased by the British monarchy from the Mississauga's of the New Credit. The settlement was later established as the Town of York and proclaimed as the new capital of Upper Canada by its lieutenant-governor, John Graves Simcoe. In 1834, York was incorporated as a city and renamed to its present name. The city was ransacked in the Battle of York during the War of 1812 and damaged in two great fires in 1849 and in 1904. Since its incorporation, Toronto has repeatedly expanded its borders through amalgamation with surrounding municipalities, most recently in 1998. Mississauga is a Canadian city in Southern Ontario on the shores of Lake Ontario, located in the Regional Municipality of Peel, in the western part of the Greater Toronto Area. 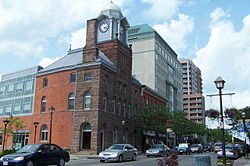 The city has a population of 713,443 as of the Canada 2011 Census, and is Canada's sixth-most populous municipality. The Municipality of Northern Bruce Peninsula is located on the Bruce Peninsula in Ontario, Canada. It is a popular vacation spot in the summer for its water sports and cottaging, and in the winter for snowmobiling.